Air Playit – Streaming Video Music to iPhone iPad and iPod Touch. Access Your Video & Music Library Anywhere. please visit http://www.airplayit.com  to  free download and install Air Playit server. 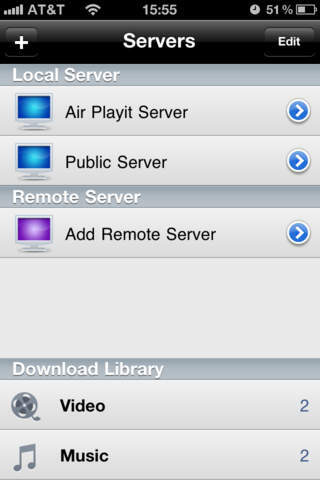 Air Playit is a video streaming & player app, it is designed to streaming videos audios to iPhone, iPad and iPod touch. Air Playit is capable of streaming and playing 320 different video & audio formats on your devices via WiFi and 3G/4G network. It acts as your personal audio video cloud server & player, and lets you watch videos on the go. This app has a 3.8 star rating (1449 ratings). It occupies the 120470th position in our ranking with 65 points. It is among the 5% best ones of its category and among the 5% best ones of the overall top.